Why buy a Silverado over a Ford F-150? Both vehicles have been in the running for America’s number one pickup every year. They are neck to neck every year. However, when football legend Howie Long put the Ford Super Duty against the Silverado 1500HD in a drag race of ¼ mile while towing 10 thousand lb trailers, there was no competition in power and strength of these two vehicles. J.D. Power and Assoc. have voted Silverado the “Most dependable large heavy-duty pickup, three years in a row”. Plus, it’s also won Best-in-class available with 445 horsepower two years in a row. With the options in performance, interiors, the technology behind the reputation and reliability of Chevrolet, there is no comparison once again. Three engine selections are available to choose from with the Silverado that include 4.3L V6 Flex Fuel, 6.2L V8 Flex Fuel and 5.3L V8 Flex Fuel. According to Kelly Blue Book Choice 5.3L V8 Flex Fuel is the best engine offering more power than the V6, and improved fuel economy than the V8. A range of moderate changes adorns the 2018 Chevrolet Silverado. On the LTZ and the LT models, the mild-hybrid eAssist package has now become available nationwide. On the tire-pressure-monitoring system, when you have reached the right amount of pressure, the system will now give you a fill alert. And, finally, the rearview camera that came on most vehicles is now standard on all vehicles. 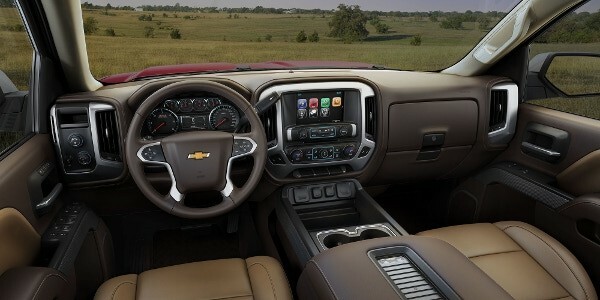 The 2018 Silverado comes equipped to connect with Android Auto compatibility, Apple Carplay, and Chevrolet Mylink are all available making access to calendars, maps, playlists, Bluetooth, and free 4G LTE Wi-Fi internet with connection for up to seven devices making your vehicle a moving office on the go. Wi-Fi capability of Silverado is a most reliable feature for all the hard workers who need to be able to contact one another on the many job sites that will require WIFI, and it’s definitely helpful. However, we are aware what all this is really about: there is no parent in the world who wants to go on a journey these days with the kids and not be able to have something for them to plug their tablets, phones, and other systems into. Additionally, The Luxury High Country Silverado model includes heated and ventilated front seats and wireless phone charging. We, at Mike Anderson Chevrolet of Merrillville, have the friendliest, most experienced team of finance managers that are waiting to help you through your car or truck buying experience. They will work closely with you, making sure you get everything you need and insure you come up with an auto-financing plan that really works with your budget. They realize how strenuous this process is and they are there to relieve some of that stress by using a host of tools that will make your financing life tremendously easier; that is what our finance specialists truly love and live to do! At Mike Anderson Chevrolet, we can’t let you drive away without offering you some sort of buying special. At the moment, we are offering 7 different and unique sales specials that we are sure you will meet the criteria of one of them. So, search the inventory for the car or truck of your dreams, and we will make it happen. At Mike Anderson Chevrolet of Merrillville, you will find a more knowledgeable, helpful, or friendly staff from the moment you walk in the door to the moment you drive off the lot in your brand-new vehicle. Our sales staff will begin by helping you choose a vehicle within your price range, they might even suggest sitting in front of one of the computers and looking at everything Mike Anderson has to offer inventory, finance, and service wise before beginning to look at cars. Car shopping is a long and tedious process and we want to make it as painless for you as possible. We are going to show you the friendliest and easiest way to make this process run smoothly and happily for you. No other dealership can offer you that.